It's all gone pretty quiet on the takeover front but that's not surprising as Stan Kroenke and his team are having to put together an offer document for the rest of the shareholders. An it's not a one sided agreement on a piece of A4 we're talking here either. The Arsenal Supporters Trust are preparing their own list of questions for Arsenal's majority shareholder, which they hope will be answered in the offer document. I imagine one of the most pertinant questions at the moment is how Mr Kroenke is going to pay for the shares he's just purchased, as it's well documented he doesn't hold large cash reserves. All will come clearer in the next 26 days. If you want to read something else on the takeover, read Martin Samuel's column in the Daily Mail. There is little news on the pitch either. The first team returned to training yesterday after having Monday off. Wojceich Szczesny and Johan Djouou started their race against time to be available to play on Sunday. We won't really know if they're likely to feature until the manager speaks with the media on Friday. 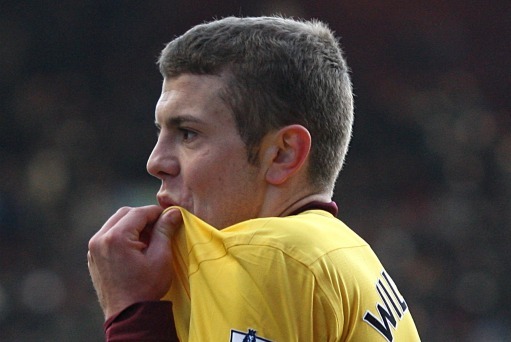 Just before 7pm, one of the best tweets on Twitter appeared, courtesy of Jack Wilshere. "People asking if I'm going [to] City? I don't kiss the Arsenal badge then leave <3 this club in my heart!" He attached a picture of him kissing the Arsenal badge after he scored against Aston Villa in November. It's good of him to put the transfer nonsense to bed so quickly. A bit of transfer speculation? Denilson has spoken about his countryman Willian, who currently plays for Shakhtar Donetsk, being the right sort of player to join us. "Willian would be perfect for Arsenal. I know him well from the Brazil team and he has a real winning mentality. "I've heard Chelsea are interested in him but I think his character could really improve our team." Can't say I know anything about him, but with Chelsea involved I would imagine they would price us out of a move for him if Arsene Wenger was interested. With Manchester United winning last night, it adds another fixture to their schedule. It also offers Chelsea a chance for revenge when they return to Old Trafford on May 8. And that's about it. Very little else going on at this stage. So enjoy your Wednesday.